The Seafood Bar. A state of the art restaurant, offering a wide range of the freshest seafood. It's our dream to provide our guests incredible seafood, and we're living that dream. Fons de Visscher was a respected fishmonger for 27 years in Helmond; a small city in The Netherlands, when he sold his fish-shop and decided to start a new adventure. He moved to Amsterdam with his wife, and he was driven by his passion for fish and great wines. Fons created The Seafood Bar which he opened in 2012 in the Van Baerlestraat. This started as a combination between an epicurean fish traiteur and a restaurant. After a few months the restaurant became so popular, they decided to completely change it into a fish-restaurant. A fish-restaurant that has set a new standard in terms of freshness, taste, service and design. Meanwhile there are three restaurants in Amsterdam (Van Baerlestraat, Spui and Ferdinand Bolstraat) and one in Utrecht (Stationsplein). Besides that, the love for selling fresh fish never left. 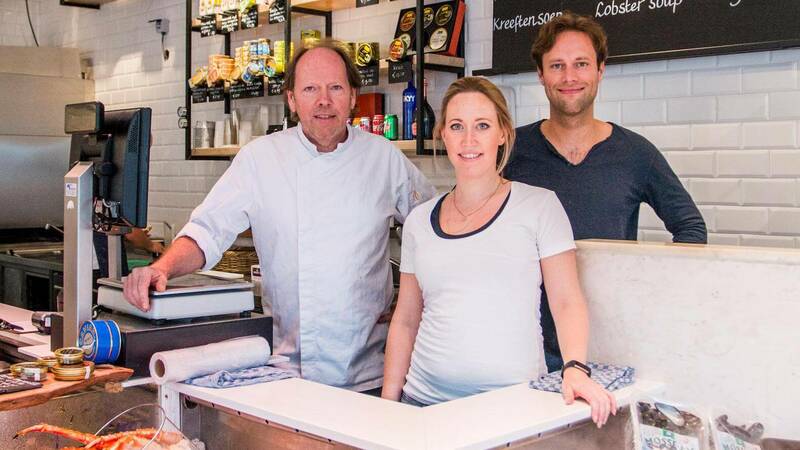 Therefore, in 2017 Fons opened his own fish-shop in the city centre of Amsterdam. The concept is very simple: incredibly fresh products, no overdone prices. In short, good food and drinks. But the real success lies in the dedication of the De Visscher family - 100% heart for the business, 24 hours a day. With attention for the guests and an eye for every detail. That spirit also reflects itself in the now more than 250 motivated and committed employees. Sustainability is very important to the family. Together with the suppliers they try to select MSC- and MSA- certified fish whenever possible. There is also strict supervision in the kitchens, to make sure that the whole fish is used, so there is no waste. Powned: Amsterdam draaft door: zet viswinkelrazzia op. ﻿The Seafood Shop, Leidsestraat 61, Amsterdam. The Seafood Shop, Leidsestraat 61, Amsterdam.